This essay grew out of the Minds of Animals Conference, August 12-13, 2008, University of Toronto, Ontario. 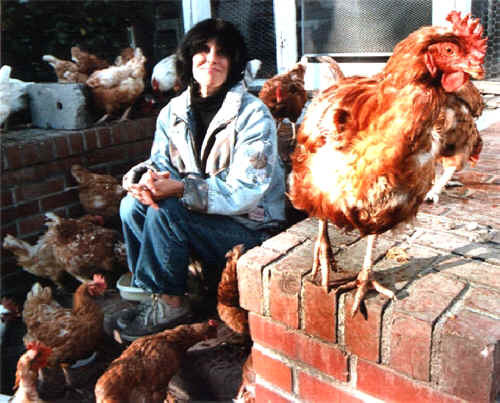 Early on as I began forming our sanctuary and organization in the 1980s, I drove one day from Maryland to New York to pick up seven former battery-caged hens. Instead of crating them in the car, I allowed them to sit together in the back seat on towels, so they wouldn’t be cramped yet again in a dark enclosure, unable to see out the windows or to see me. Also, I wanted to watch them through my rearview mirror and talk to them. Once their flutter of anxiety and fear had subsided, the hens sat quietly in the car, occasionally standing up to stretch a leg or a wing, all the while peering out from under their pale and pendulous combs (the bright red crest on top of chickens’ heads grows abnormally long, flaccid and yellowish-white in the cage environment) as I drove and spoke to them of the life awaiting. Then an astonishing thing happened. The most naked and pitiful looking hen began making her way slowly from the back seat, across the passenger seat separator, toward me. She crawled onto my knee and settled herself in my lap for the remainder of the trip. I looked at the Chicken endlessly, and I wondered. What lay behind the veil of animal secrecy? In this essay, I discuss the social life of chickens and the mental states that I believe they have and need in order to participate in the social relationships that I have observed in them. What follows is a personalized, candid discussion of what I know, what I think I know, and what I am unsure of but have observed relevant to the minds of chickens in their relationships with each other and with other species and with me. Chickens evolved in the foothills of the Himalayan Mountains and the tropical forests of Southeast Asia where they have lived and raised their families for thousands of years. Most people I talk to had no idea that chickens are natives of a rugged, forested habitat filled with vibrant tropical colors and sounds. Similarly surprising to many is the fact that chickens are endowed with memory and emotions, and that they have a keenly developed consciousness of one another and of their surroundings. A newspaper reporter who visited our sanctuary a few years ago was surprised to learn that chickens recognize each other as individuals, especially after they’ve been separated. A friend and I had recently rescued a hen and a rooster in a patch of woods alongside a road in rural Virginia on the Eastern Shore. The first night we managed to get the hen out of the tree, but the rooster got away. The following night after hours of playing hide and seek with him in the rain, we succeeded in netting the rooster, and the two were reunited at our sanctuary. 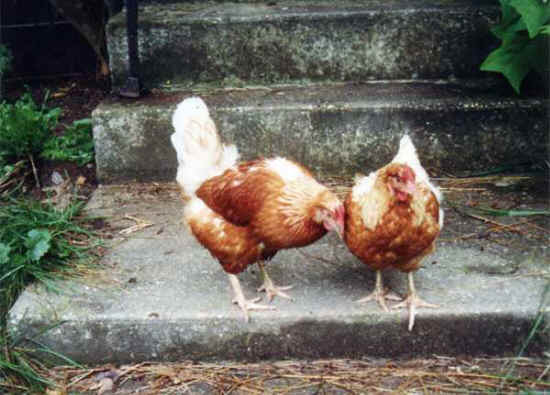 When the reporter visited a few days later, she was impressed that these two chickens, Lois and Lambrusco, were foraging together as a couple, showing that they remembered each other after being apart. What of the hens whom we observe each day at home, with what care and assiduity they govern and guard their chicks? Some let down their wings for the chicks to come under; others arch their backs for them to climb upon; there is no part of their bodies with which they do not wish to cherish their chicks if they can, nor do they do this without a joy and alacrity which they seem to exhibit by the sound of their voices. The purpose of our sanctuary on the Virginia Eastern Shore is to provide a home for chickens who already exist, rather than adding to the population and thus diminishing our capacity to adopt more birds. For this reason we do not allow our hens to hatch their eggs in the spring and early summer as they would otherwise do, given their association with the roosters in our yard. All of our birds have been adopted from situations of abandonment or abuse, or else they were no longer wanted or able to be cared for by their previous owners. Our two-acre sanctuary is a fenced open yard that shades into tangled wooded areas filled with trees, bushes, vines, undergrowth and the soil chickens love to scratch in all year round. It also includes several smaller fenced enclosures with chicken-wire roofs, each with its own predator-proof house, for chickens who are inclined to fly over fences during chick-hatching season, and thus be vulnerable to the raccoons, foxes, owls, possums and other predators inhabiting the woods and fields around us. I learned the hard way about the vulnerability of chickens to predators. Once, a hen named Eva, who had jumped the fence and been missing for several weeks, reappeared in early June with a brood of eight fluffy chicks. This gave me a chance to observe directly some of the maternal behavior I had read so much about. We had adopted Eva into our sanctuary along with several other hens and a rooster confiscated during a cockfighting raid in Alabama. Watching Eva travel around the yard, outside the sanctuary fence with her tiny brood close behind her, was like watching a family of wild birds whose dark and golden feathers blended perfectly with the woods and foliage they melted in and out of during the day. Periodically, at the edge of the woods, Eva would squat down with her feathers puffed out, and her peeping chicks would all run under her wings for comfort and warmth. A few minutes later, the family was on the move again. Throughout history, hens have been praised for their ability to defend their young from an attacker. I watched Eva do exactly this one day when a large dog wandered in front of the magnolia tree where she and her chicks were foraging. With her wings outspread and curved menacingly toward the dog, she rushed at him over and over, cackling loudly, all the while continuing to push her chicks behind herself with her wings. The dog stood stock still before the excited mother hen, and soon ambled away, but Eva maintained her aggressive posture of self-defense, her sharp, repetitive cackle and attentive lookout for several minutes after he was gone. Eva’s behavior toward the dog differed radically from her behavior toward me, demonstrating her ability to distinguish between a likely predator and someone she perceived as presenting no dire threat to her and her chicks. She already knew me from the sanctuary yard, and though I had never handled her apart from lifting her out of the crate she’d arrived in from Alabama several months earlier, when I started discreetly stalking her and her family, to get the closest possible view of them, the most she did when she saw me coming was dissolve with her brood into the woods or disappear under the magnolia tree. While she didn’t see me as particularly dangerous, she nevertheless maintained a wary distance that, over time, diminished to where she increasingly brought her brood right up to the sanctuary fence, approaching the front steps of our house, and ever closer to me - but not too close just yet. When she and her chicks were out and about, and I called to her, “Hey, Eva,” she’d quickly look up at me, poised and alert for several seconds, before resuming her occupation. One morning, I looked outside expecting to see the little group in the dewy grass, but they were not there. Knowing that mother raccoons prowled nightly looking for food for their own youngsters in the summer, I sadly surmised they were the likely reason that I never saw my dear Eva and her chicks again. Inside the sanctuary, I broke the no chick-hatching rule just once. 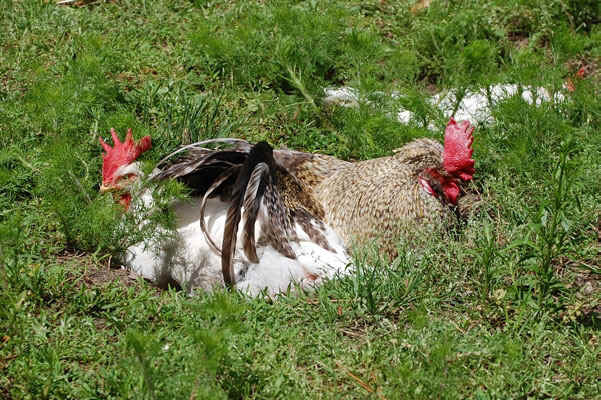 Upon returning from a trip of several days, I discovered that Daffodil, a soft white hen with a sweet face and quiet manner, was nestled deep in the corner of her house in a nest she’d pulled together from the straw bedding on the dirt floor. Seeing there were only two eggs under her, and fearing they might contain embryos mature enough to have well-developed nervous systems by then, I left her alone. A few weeks later on a warm day in June, I was scattering fresh straw in the house next to hers, when all of a sudden I heard the tiniest peeps. Thinking a sparrow was caught inside, I ran to guide the bird out. But those peeps were not from a sparrow; they arose from Daffodil’s corner. Adjusting my eyes, I peered down into the dark place where Daffodil was, and there I beheld the source of the tiny voice - a little yellow face with dark bright eyes was peeking out of her feathers. I kneeled down and stared into the face of the chick who looked intently back at me, before it hid itself, then peeked out again. I looked closely into Daffodil’s face as well, knowing from experience that making direct eye contact with chickens is crucial to forming a trusting, friendly relationship with them. If chickens see people only from the standpoint of boots and shoes, and people don’t look them in the eye and talk to them, no bond of friendship will be formed between human and bird. I’ve seen this difference expressed between hens we’ve adopted into our sanctuary from an egg production facility, for example, and chickens brought to us as young birds or as someone’s former pet. Former egg-industry hens tend to look back at me, not with that sharp, bright, direct focus of a fully confident chicken, but with a watchful opacity that no doubt in part reflects their having spent their entire previous lives in cages or on crowded floors in dark, polluted buildings that permanently affected their eyes before coming to our sanctuary. Psychologically, it’s as if they’ve pulled down a little curtain between themselves and human beings that does not prevent friendship but infuses their recovery with a settled strain of fear. I’ll say more about these hens presently. 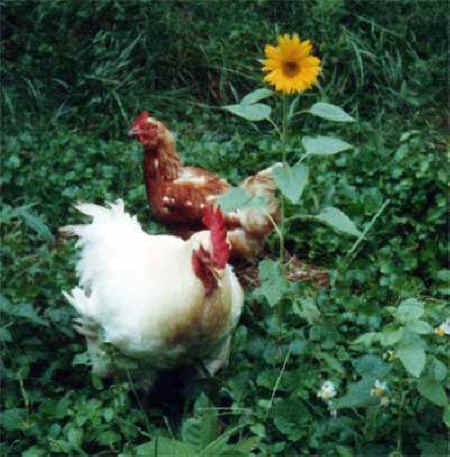 From the very first, a large red rooster named Francis regularly visited Daffodil and her chick in their nesting place, and Daffodil acted happy and content to have him there. Frequently, I found him quietly sitting with her and the little chick, who scrambled around both of them, in and out of their feathers. Though roosters will mate with more than one hen in the flock, a rooster and a hen will also form bonds so strong that they will refuse to mate with anyone else. Could it be that Francis was the father of this chick and that he and Daffodil knew it? He certainly was uniquely and intimately involved with the pair, and it wasn’t as though he was the head of the flock, the one who oversaw all of the hens and the other roosters and was thus fulfilling his duty in that role. Rather, Francis seemed simply to be a member of this particular family. For the rest of the summer, Daffodil and her chick formed a kind of enchanted circle with an inviolable space all around themselves, as they roamed together in the yard, undisturbed by the other chickens. Not once did I see Francis or any of the other roosters try to mate with Daffodil during the time she was raising her frisky chick - the little one I named Daisy who grew up to be Sir Daisy, a large, handsome rooster with white and golden-brown feathers. The poultry industry represents chickens bred for food as mentally vacuous, eviscerated organisms. Hens bred for commercial egg production are said to be suited to a caged environment, with no need for personal space or normal foraging and social activity. They are characterized as aggressive cannibals who, notwithstanding their otherwise mindless passivity and affinity for cages, cannot live together in a cage without first having a portion of their sensitive beaks burned off - otherwise, it is said, they will tear each other up. Similarly, the instinct to tend and fuss over her eggs and be a mother has been rooted out of these hens (so it is claimed), and the idea of one’s having a social relationship with such hens is dismissed as silly sentimentalism. I confess I have yet to meet a single example of these so-called cannibalistic cage-loving birds. Intentionality in chickens is shown in many ways. An example is a hen’s desire not only to lay an egg, but to lay her egg in a particular place with a particular group of hens, or in a secluded spot she has chosen - and she has definitely chosen it. I’ve watched hens delay laying their egg until they got where they wanted to be. Conscious or not at the outset, once the intention has been formed, the hen is consciously and emotionally committed to accomplishing it. No other interpretation of her behavior makes sense by comparison. Sarah, for example, a white leghorn hen from a battery-cage egg-laying operation who came to our sanctuary with osteoporosis and a broken leg, was determined, as she grew stronger, to climb the front stairs of our house, one laborious step at a time, just so that she could lay her egg behind the toilet in the bathroom next to the second floor landing. This was a hen, remember, who had never known anything before in her life but a crowded metal cage among thousands of cages in a windowless building. I was Sarah’s friendly facilitator. I cheered her on, and the interest I showed in her and her wishes and successes was a critical part of her recovery, both physical and mental. In her mind’s eye as well is my own role in her morning ritual. I hold the Keys to the little straw Kingdom Josephine is eager to reenter, and she accompanies me trustingly and expectantly as we make our way toward it. Likewise, our hen Charity knew that I held the keys to the cellar where she laid her eggs for years in a pile of books in a cabinet beside a table I worked at. Unlike Josephine, Charity wanted to lay her egg in a private place, free of the fussing of hens gathered together and sharing their nest, often accompanied by a rooster boisterously crowing the egg-laying news amid the cacophony of cackles. Charity didn’t mind my presence in the cellar. She seemed to like me sitting there, each of us intent on our silent endeavor. If the cellar door was closed, blocking her way to the basement when she was ready to lay her egg, she would pace back and forth in front of the window on the opposite side of the house where I sat at my desk facing the window. If I didn’t respond quickly enough, she’d start pecking at the window with an increasing bang to get me to move. By the time I ran up the steps and opened the cellar door, she’d already be standing there, having raced around the house as soon as she saw me get up. Down the cellar steps she’d trip, jump into the cabinet, and settle as still as a statue in her book nook. After she had laid her egg and spent a little time with it, she let me know she was ready to go back outside, running up the steps to the landing where she waited until I opened the door, and out she went. This is not to suggest that chickens are unlimitedly malleable. Mother hens and their embryos have a genetic repertoire of communications that are too subtle for humans to decipher entirely, let alone imitate. 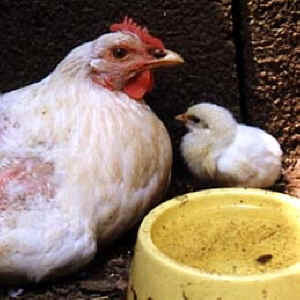 Chickens have ancestral memories that predispose the development of their self-identity and behavior. Even chickens incubated in mechanical hatcheries and deprived of parental influence - virtually all of the birds at our sanctuary - behave like chickens in essential ways. For instance, they all follow the sun around the yard. They all sunbathe, dropping to the ground and lying on their sides with one wing outspread, then turning over and spreading out the other wing while raising their neck feathers to allow the warm sunlight and vitamin D to penetrate their skin. Similar to dustbathing, sunbathing is a social as well as a healthful activity for chickens, where you see one bird drop to the ground where the sun is shining, followed by another and then another, and if you don’t know what they are doing, you will think they had died the way they lie still with their eyes closed, flopped like mops under the sun. five "Sentinel Sister" hens, and Aubrey the turkey at UPC. A less happy ambivalence appeared in a soft-colored gray and white rooster I named Ruby when he was brought to our sanctuary as a young bird by a girl who swore he was a hen. Following me about the house on his brisk little legs, even sleeping beside me on my pillow at night, Ruby grew up to be a rooster. In spite of our close relationship during his first months of life, once he became sexually mature, Ruby’s attitude toward me changed. In the yard with the other chickens, he showed no disposition to fight. He didn’t attack other birds or provoke antagonisms. He fit in with the existing flock of hens and roosters, but toward me and other people he became compulsively aggressive. As soon as I (or anyone) appeared in the yard, Ruby ran from wherever he was and physically attacked us. Having to work in the yard under his vigilant eye, I took to carrying a bottomless birdcage and placing it over him while I worked. When finished I would lift it off him and walk backward toward the gate with the birdcage in front of me as a shield. What I saw taking place in Ruby was a conflict he couldn’t control, and from which he suffered emotionally, between an autonomous genetic impulse on the one hand, and his personal desire on the other to be friendly with me. He got to where when he saw me coming with the birdcage, he would walk right up and let me place it over him as if grateful for my protection against a behavior he didn’t want to carry out. Even more tellingly, he developed a syndrome of coughs and sneezes whenever I approached, symptomatic, I believed, of his inner turmoil. He didn’t have a respiratory infection, and despite his antagonism toward me, I never felt that he hated me but rather that he suffered from his dilemma, including his inability to manage it. My personal experience with our sanctuary roosters confirms the literature I’ve read about wild and feral chickens documenting that the majority of roosters do not physically and compulsively attack one another. 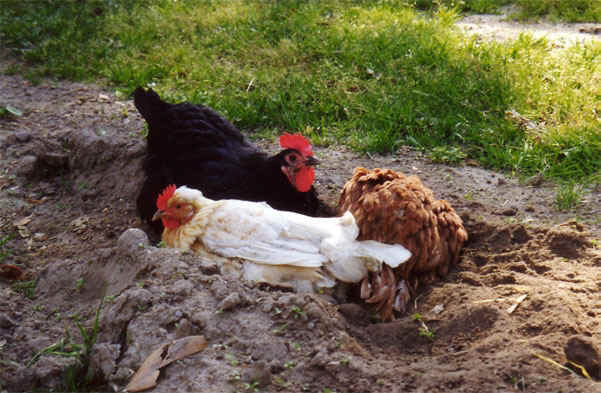 Chickens maintain a social order in which every member of the flock has a place and finds a place. During the day our roosters and hens break up into small, fluctuating groups that are somewhat, but by no means, rigidly territorial. Antagonisms between roosters are resolved with bloodless showdowns and face-offs. The most notable exception is when a new rooster is introduced into an existing flock, which may provoke a temporary flare up, but even then, there is no predicting. Playfully, I got into the habit of yelling “Pola, Help!” whenever Ruby acted like he was ready to come after me, which worked as well as the birdcage. Hearing my call, Pola would perk up, race over to where Ruby was about to charge, and run him off with such cheerful alacrity it was as if he knew this was our little game together. I’d always say, “Thank you, Pola, thank you!” and he acted very pleased with his performance and the praise I lavished on him for “saving” me. He stuck out his chest, stretched up his neck, flapped his wings vigorously, and crowed triumphantly a few times. Roosters crow to announce their accomplishments. Even after losing a skirmish, a rooster will often crow as if to compensate for his loss or deny its importance or call it a draw. Last summer as I sat reading outside with the chickens, I was diverted by our two head roosters, Rhubarb and Sir Valery Valentine, crowing back and forth at each other in their respective yards just a few feet apart. It looked like Sir Valery was intentionally crossing a little too far into Rhubarb’s territory, and Rhubarb kept dashing at him to reinforce the boundary. There was not a hint of hostility between them; rather the contest, I decided as I watched them go at it, was being carried out as a kind of spirited mock ritual, in which each rooster rushed at the other, only to halt abruptly on his own side of the invisible buffer zone they apparently had agreed upon. At that point, each rooster paced up and down on his own side, steadily eyeing the other bird and crowing at him across the divide. After ten minutes or so, they each backed off and were soon engrossed in other activities. Roosters are so energetic and solicitous toward their hens, so intensely focused on every aspect of their social life together that one of the saddest things to see is a rooster in a state of decline due to age, illness or both. 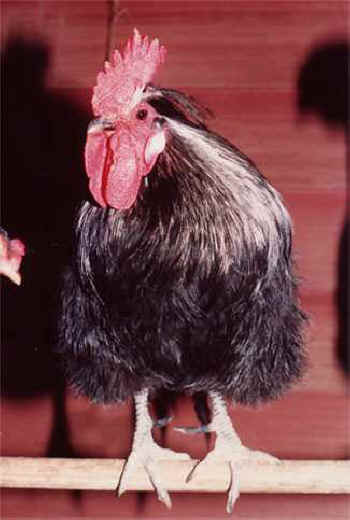 An aging or ailing rooster who can no longer hold his own in the flock suffers severely. He droops, and I have even heard a rooster cry over his loss of place and prestige within his flock. This is what happened to our rooster Jules - “Gentleman Jules,” as my husband fondly named him - who came to our sanctuary in the following way. One day I received a phone call from the resident of an apartment building outside Washington, DC, saying that a rooster was loose in the complex and was being chased by children who were throwing stones at him. After two weeks of trying, she managed to lure the rooster into the laundry room and called me to come get him. Expecting to find a cowering and emaciated creature needing to be carefully lifted out of a corner, I discovered instead a bright-eyed perky, chatty little fellow with glossy black feathers like Freddaflower. I drove him to our sanctuary and set him outside with the flock, which at the time included our large white broiler rooster Henry, and our feisty bantam rooster, Bantu, who loved nothing better than sitting in the breeze under the trees with his two favorite large brown hens, Nadia and Nadine. Jules was a sweet-natured rooster, warm and affectionate to the core. He was a natural leader, and the hens loved him. Our dusky brown hen Petal, whom we’d adopted from another sanctuary, was especially devoted to Jules. Petal had curled gnarly toes, which didn’t stop her from whisking away from anyone she didn’t want to come near her; otherwise she sat still watching everything, especially Jules. Petal never made a sound; she didn’t cluck like most hens - except when Jules left her side a little too long. Then all of a sudden, the silent and immobile hen with the watchful eye let out a raucous SQUAWK, SQUAWK, SQUAWK, that didn’t stop until Jules had lifted his head up from whatever he was doing, and muttering to himself, ran over to comfort his friend. Two years after coming to live with us, Jules developed a respiratory infection that with treatment seemed to go away, but left him weak and vulnerable. He returned to the chickenyard only to find himself supplanted by Glippie, with whom he had used to be cordial, but was now dueling, and he didn’t have the heart or strength for it. His exuberance ebbed out of him and he became sad; there is no other word for the total condition of mournfulness he showed. His voice, which had always been cheerful, changed to moaning tones of woe. He banished himself to the outer edges of the chickenyard where he paced up and down, bawling so loudly I could hear him crying from inside the house. I brought him in with me and sought to comfort my beloved bird, who showed by his whole demeanor that knew he was dying and was hurt through and through by what he had become. Jules developed an abdominal tumor. One morning our veterinarian placed him gently on the floor of his office after a final and futile overnight stay. Jules looked up at me from the floor and let out a low groan of “ooooohh” so broken that it pierced me through. I am pierced by it now, remembering the sorrow expressed by this dear sweet creature, “Gentleman Jules,” who had loved his life and his hens and was leaving it all behind. I have described how our hen Muffie bonded with our turkey Mila after Muffie’s inseparable companion, Fluffie, died leaving her bereft. Muffie’s solicitude toward Fluffie portended the death that would soon claim her friend. Like Jules, Fluffie developed an infection that treatment had seemed to heal, but she never fully recovered. One day, I looked out the kitchen window and saw Muffie straddled on top of Fluffie with her wings extended over her. I called my husband to come take a look at this moving and yet disturbing scene. We saw it repeated several times over the next few days. On a late afternoon, I went outside to put Muffie and Fluffie in for the night but found them already in their house in the straw. Fluffie stood drooping with her head and tail curved toward the ground and Muffie stood motionless beside her. I rushed Fluffie to the veterinarian and brought her home with medicine, but she died that same night in the small bedroom where she and Muffie had liked to perch on top of the bookcase in front of the big window overlooking the yard. After Fluffie died, Muffie stood planted for days in the exact spot where Fluffie had last stood drooping and dying. Now, Muffie drooped in her place. She no longer scampered into the woods or came bursting into the kitchen to jump up on the sink and peck holes in the sponge floating on top of the dishwater. She was not interested in me or the other chickens. Two weeks of this dejection and I said, “We must get Muffie a new sister.” That is how Petal, who had loved Jules, came to live in our sanctuary. The minute Petal appeared, Muffie lost her torpor and became a bustling “police miss,” picking on Petal and patrolling everything Petal did until finally the two hens became amiable, but they were never pals. Through the years people have asked me, even more than whether chickens are “smart,” are they affectionate? - toward people, they particularly want to know. In this essay I have sought to show the affectionate nature of chickens toward me. Because I don’t just feed them but I also talk to them and look them in the eye and express my feelings for them, the birds at our sanctuary gather around me and stand there serenely preening themselves or sit quietly on the ground next to my chair while I read and chat with them. 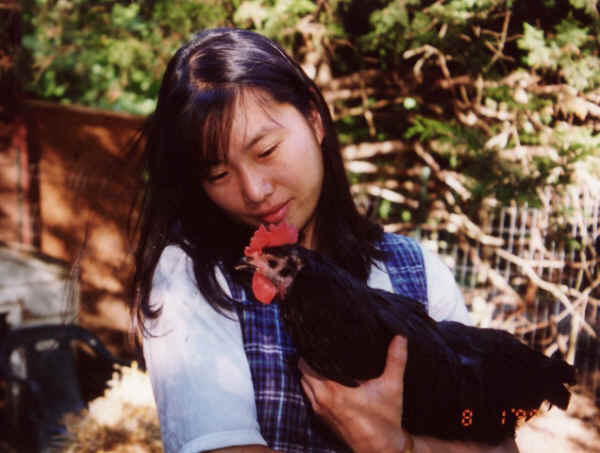 One of my most poignant memories is of a large black, beautiful hen I named Mavis. Mavis had been dropped off at a shelter by a man who’d exhibited her at agricultural fairs. She must have spent her whole life immobilized on the floor of a cage with a keeper who treated her like an object. During her first two weeks at our sanctuary, Mavis could not even stand up without crumbling to the ground, and she was deeply shy and inexpressive. In the chicken yard she sat alone by the fence and poked around a little by herself without showing or attracting interest. I saw no sign that she was ever going to recover from the emotional and sensory deprivation of her previous life. During this time, we had three adult broiler hens - Bella Mae, Alice, and Florence. They were the opposite of Mavis. All I had to do was crouch down in the yard, and here comes one of my Three Graces, as I called them, Bella Mae for example, bumping up against me with her ample breast for an embrace. Immediately, Alice and Florence would hastily plod over on their heavy feet to participate in the embracement ceremony. Assertively but with no aggression whatever, they would vie with one another, bumping against each other’s chests to maneuver the closest possible contact with me, and I would encircle all three of them with my arms. One day as we were doing this, I looked up and saw Mavis just a few feet away, staring at us. The next time, the same thing happened. There was Mavis with her melancholy eyes watching me hugging the three white hens. And then it struck me - Mavis wants to be hugged. I withdrew from the hens, walked over and knelt beside Mavis and pulled her gently toward me. It didn’t take much. She rested against me in a completeness of comfort that seemed to include her gratitude that her shy desire had been understood. In my first years of keeping chickens there were no predators, until a fox found us, and we built our fences - but only after eleven chickens disappeared rapidly under our nose. The fox would sneak up in broad daylight, raising a clamor among the birds. Running out of the house I’d see no stalker, just sometimes a soul-stabbing bunch of feathers on the ground in the midst of panic. When our bantam rooster Josie was taken, his companion Alexandra ran shrieking through the kitchen, jumped up on a table and could not stop shrieking and was never the same afterward. The fox killed Pola, our big red rooster who had so gallantly responded to my calls begging him to “save” me from Ruby. I am sure he was attacked while trying to protect his hens the day he disappeared, while I sat obliviously at the computer. It was too much. I sat on the kitchen floor crying and screaming. At the time, I was caring for Sonja, a big white warm-natured, bouncy hen I was treating for wounds she’d received before I rescued her. As I sat on the floor exploding with grief and guilt, Sonja walked over to where I sat weeping. She nestled her face next to mine and began purring with the ineffable soft purr that is also a trill in chickens. She comforted me even as her gesture deepened the heartache I was feeling in that moment about the painful mystery of Pola and the mystery of all chickens. Did Sonja know why I was crying? I doubt it, but maybe she did. Did she know that I was terribly sad and distressed? There is no question in my mind about that. She responded to my grief with an expression of empathy that I have carried emotionally in my life ever since. It is experiences such as this and others I have described in this essay that have made me a passionate advocate for chickens. I do not seek to sentimentalize chickens but to characterize them as best I can within the purview of my own observations and relationships with them. 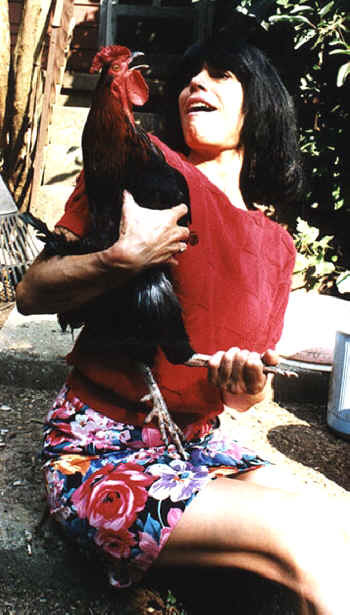 In the 1980s I wrote an essay about an abandoned crippled broiler hen named Viva who, more than any other single cause, led me to found United Poultry Concerns in 1990. It is hard for me to evoke in words how expressive she was in spite of her handicap and despite the miserable life she had had before I lifted her out of her misery and brought her home with me. My experience with chickens for more than twenty years has shown me that chickens are conscious and emotional beings with adaptable sociability and a range of intentions and personalities. If there is one trait above all that leaps to my mind in thinking about chickens when they are enjoying their lives and pursuing their own interests, it is cheerfulness. Chickens are cheerful birds, quite vocally so, and when they are dispirited and oppressed, their entire being expresses this state of affairs as well. The fact that chickens become lethargic in continuously barren environments, instead of proving that they are stupid or impassive by nature, shows how sensitive these birds are to their surroundings, deprivations and prospects. Likewise, when chickens are happy, their sense of wellbeing resonates unmistakably. 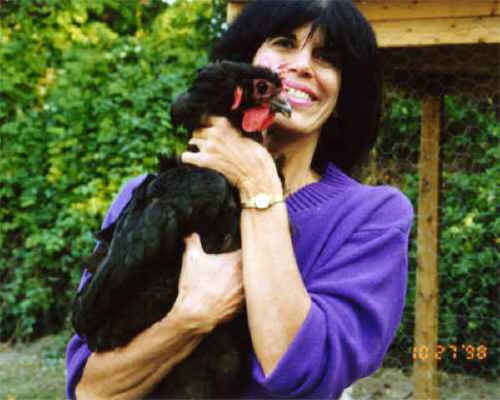 Karen Davis, PhD is the president and founder of United Poultry Concerns, a nonprofit organization dedicated to the compassionate and respectful treatment of domestic fowl. She’s the editor of UPC’s quarterly magazine Poultry Press and the author of several books including Prisoned Chickens, Poisoned Eggs: An Inside Look at the Modern Poultry Industry (1996; Revised Edition 2009), More Than a Meal: The Turkey in History, Myth, Ritual and Reality, and The Holocaust and the Henmaid’s Tale: A Case for Comparing Atrocities. All these books are other flyers and handouts are available through the UPC website. 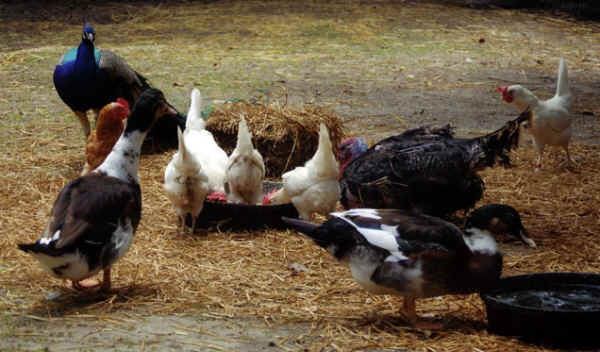 Karen maintains a sanctuary for chickens, turkeys and ducks on the Eastern Shore of Virginia.